Head & Neck Pathology presents scholarly papers, reviews and symposia that cover the spectrum of human surgical pathology within the anatomic zones of the oral cavity, sinonasal tract, larynx, hypopharynx, salivary gland, ear and temporal bone, and neck. 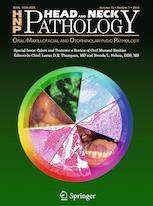 The journal publishes rapid developments in new diagnostic criteria, intraoperative consultation, immunohistochemical studies, molecular techniques, genetic analyses, diagnostic aids, radiographic imaging, and application of uniform terminology to allow practitioners to continue to maintain and expand their knowledge in the subspecialty of head and neck pathology. Coverage of practical application to daily clinical practice is supported with proceedings and symposia from international societies and academies devoted to this field.